Where do you turn for hope when you already have the answer--but the answer isn't working? 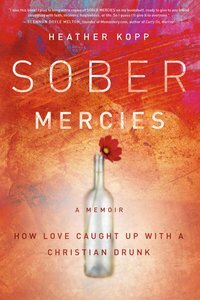 As a long-time Christian, Heather Kopp never expected to become an out-of-control alcoholic who kept private stashes of booze all over the place--tucked behind books in her study, zipped into a special compartment in her oversized purse, at the back of her closet stuffed inside her boots. Even as her career and marriage teetered on the brink, Kopp couldn't get a grip, desperately hiding the true extent of her drinking from the rest of the world--her husband included. During the day she wrote books about God and prayer and family. At night she'd locked herself in her bathroom to guzzle chardonnay. Meanwhile, as she watched in horror, her grown son descended into his own nightmare of drugs and alcohol. She feared for his life, yet she couldn't stop drinking long enough to help him--or find a way out for herself. Engaging, funny and bracingly honest, Kopp shares her remarkable journey into darkness...and back to the light again. Her story reveals the unique challenges and spiritual conundrums Christians face when they become ensnared in an addiction, and the redemption that's possible when we finally reach the end of ourselves. As you follow Kopp's sincere, stumbling journey toward freedom and a deeply satisfying relationship with God, you'll find renewed hope--and practical steps of recovery--for your own journey.